Your daily scoop of what State of the Union is watching today, April 11, 2014. 1. So long Sebelius. President Obama announced the resignation of Health Secretary Kathleen Sebelius. Sebelius, who has been under fire because of the botched rollout of Obamacare, is leaving office on a higher note as sign-ups for the federal health insurance exchanges have topped seven million. Obama praised Sebelius, saying under her leadership the rollout "turned the corner, got it fixed, got the job done, and the final score speaks for itself." 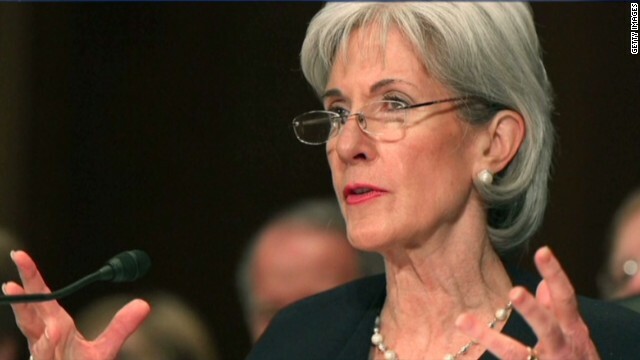 Sebelius called her tenure as HHS Secretary "the most meaningful work I’ve ever been a part of. In fact, it has been the cause of my life." Obama is nominating Office of Managment and Budget director Sylvia Matthews Burwell as Sebelius' replacement. Does Sebelius' departure give the White House a chance to rebrand Obamacare? We'll get our political panel's take Sunday on State of the Union. 2. Jeb Bush defends himself. Jeb Bush is sticking by his recent comments on immigration reform that sparked a backlash from some conservatives. In a speech Thursday night, the former Florida Republican governor said there was no conflict to enforcing the law and "having some sensitivity to the immigrant experience, which is part of who we are as a country." Last weekend, Bush defended the majority of illegal immigrants as people looking for opportunities to do better for their families. "Yes, they broke the law, but it's not a felony. It's an act of love," he said. 3. Midterm landscape. Conventional wisdom says 2014 will be a good election cycle for Republicans, not so much for the Democrats. But the two men responsible for getting more members of their parties elected to Congress laid out their messages in a spirited interview with CNN's Candy Crowley. "It's who's got your back. Now, this budget that they passed, that the Republicans passed, is not a blueprint for prosperity... it's a blueprint for higher taxes for the middle class," said Rep. Steve Israel, chairman of the Democratic Congressional Campaign Committee. "The Democrats' plans all raise taxes, raise spending and none of them ever balance," Rep. Greg Walden, chairman of the National Republican Congressional Committee, said. Be sure to see the full interview with Rep. Israel and Rep. Walden Sunday on State of the Union. 4. Mixed signals about Flight 370. The coordinator of the search for the missing Malaysian jetliner are playing down a fifth "ping" that was detected Thursday saying the sound was "unlikely to be related to the aircraft black boxes." Searchers have heard four other underwater pulse signals since last Saturday but there has been "no major breakthrough" according to Australian chief search coordinator Angus Houston. Australian Prime Minister Tony Abbott was more optimistic about the search. "We have very much narrowed down the search area, and we are very confident that the signals that we are detecting are from the black box," Abbott said Friday. We'll get newest details on the missing plane on this Sunday's State of the Union.